Government said that it will deploy cross border Optical Fibre Cable (OFC) system at a cost of Rs 3.7 billion between Pakistan and China for security of information, reported Business Recorder, quoting official sources. Paper said that the need of this cross-country fiber optic cable grew after security concerns from Pakistan and China, who fear the possibility of India monitoring the communication activities, through already active undersea cables. The project was deliberated at a recent meeting of the Executive Committee of the National Economic Council (ECNEC) under the chairmanship Finance Minister Dr. Abdul Hafeez Shakih. 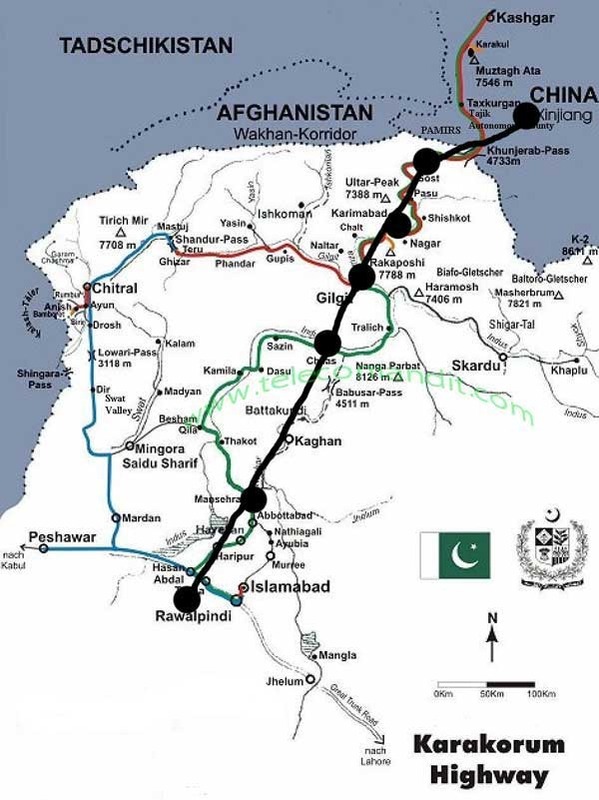 The project consists of laying 820 km of Optical Fibre Cable (OFC) along the Karakaram Highway, from Rawalpindi to Khunjrab Pass (Chinese border via Mansehra, Chilas, Danyore (Gligit), Karimabad and Sust). At present, Pakistan’s international connectivity with the world is through undersea cables SEA-ME-WE 3&4 and IMEWE, and Pakistan is connected through spurs only. “This dependency is not only a risk but also entails security concerns. The voice/data and internet traffic can be monitored and disturbed easily by India,” sources said. To divert such a threat, sources said, a Memorandum of Understanding (MoU) was signed with China in April 2007 for the establishment of a secure international OFC link between China and Pakistan along Karakaram Highway which is being widened by China Road and Bridge Company. Through this project, a link will be created between Pakistan and Trans-Asia Europe (TAE) cable in China, which would enable both Pakistan and China to have alternative routes for their international telecom traffic, sources added. Successful implementation of the project would provide Pakistan with a direct telecom access to China and the Central Asian States. Thus, development of telecom infrastructure will facilitate trade with these countries and would also promote tourism in the region, sources quoted Ministry of Information Technology as commenting on the project. Apart from security assurance, the project is expected to generate revenue, approximately Rs 1.5 billion in the first three years and, in the fourth year, the financial dividends are likely to grow. The project would be funded within Public Sector Development Program (PSDP) and out of a Chinese soft loan. The project also involves Rs 3.2 billion foreign exchange component (FEC). If national security is real concern, then this Fiber Optic cable should be solely under national control and not involve any telecom operator. Because most telecom companies in Pakistan have foreign control and India herself or through her sympathizers, big or small, can do many things to jeopardize and eavesdrop national security communication. What if China is monitoring our communications? The NSA is monitoring you… yes, you – personally. This certainly is good news. But if memory serves me right most of the job has already been done. PTCL OFC exists between Rawalpindi and Abbottabad. Between Abbottabad and Gilgit Optical Fiber was laid by SCO (Special Communication Organization, a Govt owned Army operated Telco) a few years back. In fact the route followed was Abbottabad > Gilgit > Hunza > Karimabad. Also Skardu was added in the loop and it went up to Minimerg. So if they want to lay it again it doesn’t make much sense. Why not simply extend from there to Khunjerab and that’s all. Even about three years back there was talk of extending it to China. If u need a experince able optical fiber cable for blowing ….so give me ur cobtact number and … i also type my saudia cell fone number …. What’s the number ur compny….. I have a experience optical fiber cable. Blowing ……i allready work in saudia with huwaii project GCC ….. I am driver.fourman.and optical fiber cable blowing oprater in saudia….. Contact numbe=this’s my pakistan number there i am using for whatsapp .imo etc etc so plz contact with me….